"Today, sadly, we hear voices from Anbar who have abandoned all their values, sense of honor and manliness. They have openly declared their desire to have American troops help rid them of Daesh. They forget that Daesh is a puppet of the U.S. and Israel - which know Daesh and manipulate it. ... Taking shelter behind a foreigner is shameful and will not be expunged for years or decades. Taking cover behind a foreigner will offer Daesh the opportunity to remain and grow stronger." There were many points of discord and differences in the way our dear brothers in Ramadi, Fallujah, Al Karma, Heet, Rawa, Aana, Haditha, Kabissa, Hasiba and Al Kaem dealt with the 2003 occupation. However, that didn't prevent the blood of the sons of the South [Shiite] from mixing with the blood of the sons of the West [Sunni]. The sons of Anbar didn't forget that debt, which is why they threw themselves into the battle for Holy Najaf, and the combined assembly of Iraqis was present and acquitted themselves honorably in both Anbar and Holy Najaf. Never did we hear our families and loved ones yearn for federalism. They were people who rejected the notion because they loved a unified Iraq. True - federalism isn't the same as partition. Rather it is an administrative process that was adopted in the wake of the fall of Saddam's Baathist regime. At the time, federalism was seen as the solution to all the pains and burdens of Iraq and Iraqis. What I remember about the people of Anbar is their absolute rejection of the Americans. I also remember the zeal and manliness in their care for their community, because they considered the presence of foreign forces an assault on their honor, as they proclaimed day and night their rejection of the presence of the Americans. The Americans dishonored all that is sacred and were behaved toward the sons and daughters of Anbar in way that did not comport, as they claimed, with the traditions of the West. Saleh al-Mutlaq and Zafir Al Aani [Sunnis, former Baath Party members and current Iraqi politicians] were mourning over the fact that the Americans were weighing the virtuous daughters of the Anbar sheikhs by touching their hips. They considered the presence of the Americans as a prelude to tearing apart the body of the nation and its unity and that they were similarly weighing the plundering of Iraq's wealth and the achievement of the ambitions of the occupying power. Today, sadly, we hear voices from Anbar who have abandoned all their values, sense of honor and manliness. They have openly declared their desire to have American troops help rid them of Daesh [ISIL]. 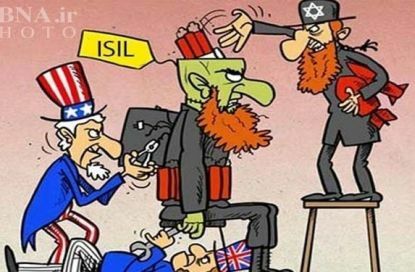 They forget that Daesh is a puppet of the U.S. and Israel - which know Daesh and manipulate it. These people say that the Americans are no longer occupiers, nor are they covetous destroyers. They say they no longer look to weigh and measure the daughters of the sheikhs, nor are they conquerors, nor do they themselves intend to partition Iraq. If you call on the Americans to come it may appear that it is all for a good cause. The results, however, will be ill-fated. If they enter again they will not leave without taking what they want – which is not what the people of Anbar want. If they enter they will not push Daesh out. Rather, there will be an agreement by which they [Daesh] will either shift to another location to perform a mission similar to the one it has accomplished in Iraq or remain to torment a country that has been torn asunder. The people of Anbar are well aware that Daesh used to be among them, in their homes, at their feasts, chanting and glorifying al-Qaeda and its crimes. The tambourine banging of Minister Rafe' Al Issawi [a Sunni from Anbar - now finance minister] still rings in the ears of the people, from when he helped celebrate in public squares "honor and pride" - as they used to say. During those festivities the terrorists would chant, "we are an organization called al-Qaeda … We cut off heads and change borders." Iraq is not in need of men. In all the world there are none more courageous than the Iraqis. All they need is moral support, weapons and time to wipe out Daesh and whoever supports and harbors them. Time has incontrovertibly proven that through unity among the various elements of the Iraqi people - in Dalueea, Samrra, around the Mosul dam, Haditha and Amerli, they are more than capable of crushing the myth of Daesh and pulverizing it under foot. Taking shelter behind a foreigner is shameful and will not be expunged for years or decades. Taking cover behind a foreigner will offer Daesh the opportunity to remain and grow stronger. Those so frightened, terrorized and cowardly that they would hide behind the foreigner - such collaborators should leave the battlefield to noble men, sons of the noble tribes of Ramadi and Fallujah. They have answered the nation's call and are giving of themselves to protect Iraq and its sons and daughters from the abomination and aggression by the cowards of Daesh.